Unlimited access to both Rathnew & Arklow Gyms. Personalised Training Plans updated every 6 weeks. Includes all benefits of Gym-Only Membership. *See details about Pure Fitness Classes here. Easy to set up and cancel - this is our most popular membership type. * Please note: Payments will be taken each month automatically until cancelled. Purchase a number of months membership up front with a once off payment! These options suit our customers who don't want a recurring membership payment each month. Full Gym & Classes Membership Open To All First Responders. Please book your induction session below after purchasing your membership to receive your training plan and have your fingerprint taken for unlimited access to the gym. 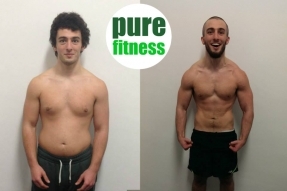 "Pure Fitness helped me to see fitness as an enjoyable lifestyle choice instead of a chore that I hated. Since joining Pure Fitness I've been able to keep up my gym training consistently - without affecting my social life. I love it!" "Having tried all of the gyms in the area, I can safely say Pure Fitness is far and away the best around. The results I have achieved have been way beyond my expectations - can't recommend them enough." 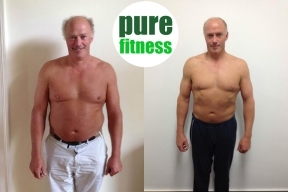 "I joined Pure Fitness with an ongoing knee injury which I thought would hold me back in the gym. However, the lads built my training plan around the injury and even strengthened the knee as well as getting great results. Now I'm registered to compete in the Irish Powerlifting Championships with the gym's team in January, I can't wait!" 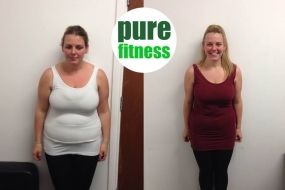 "I joined Pure Fitness having tried a number of other programmes without seeing the results I really wanted. The lads put together a plan for me based around what I wanted to achieve. It was easy to follow and I saw the results within a couple of weeks. I'm still training in Pure Fitness and it's great, I'm looking forward to see what else I can achieve!" 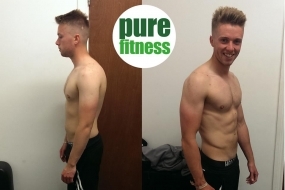 "I started off with Pure Fitness by taking part in their Forty Day Transformation programme (which has since been improved and become the Sixty Day Shred). It was amazing - they gave me great support and I achieved results that I hadn't managed over years of trying different fad diets, dance classes, etc. The lads were so helpful and I'm still a regular member today. It's great!" "I joined the gym having tried a few other options, but I never enjoyed them enough to maintain what I achieved. It's always a great atmosphere in the gym and everyone cheers each other on through the classes. Pure Fitness is a great place to get fit and have fun while you're doing it." Copyright © 2019 Pure Fitness Gyms Ltd.